In October 2016, Tesla CEO Elon Musk stood on the Universal Studios set of Desperate Housewives and revealed to a crowd that the roof tiles on the “Wisteria Lane” houses were actually solar panels, showcasing a future in which Tesla installs attractive, solar tiles that power homes across the the country. But it’s taken a while for Telsa solar roofs to move beyond fictional homes. The company started taking pre-orders last May, requiring a $1,000 deposit. Last month, Tesla told Ars Technica that it had completed a pilot installation program and that only Tesla employees had been able to install the tiles up until that time. 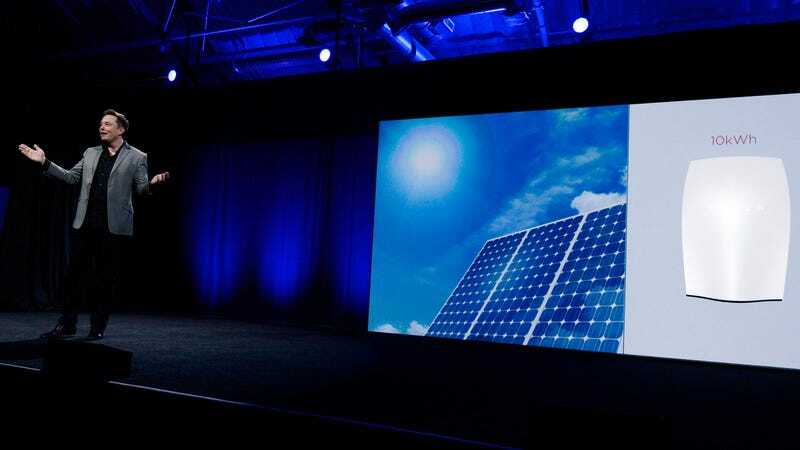 The company also said it was increasing production at its Gigafactory in Buffalo, New York, which it got through its 2016 Solar City acquisition. Yesterday, a Bloomberg report revealed that Tesla is about to make a big push into the mainstream market, by putting Tesla-branded selling stations in 800 Home Depot locations. With 2,200 locations in total, Home Depot is the largest home improvement chain in the country. The Tesla kiosks are set to start going up sometime in the first half of this year. At first, these Tesla spaces will sell regular solar panels and Powerwall batteries that store solar energy. But a source told the news outlet that Home Depot could soon offer the solar tiles as well. At the selling stations, Tesla employees will demonstrate the photovoltaic panels and batteries, presumably explaining how they work and what the benefits are. That way, any customer looking to replace a fuse or searching for someone to help them figure out if they can install a light dimmer could get swept up into a sales pitch about how they could save hundreds per month over 30 years if they install Tesla solar panels. In their effort to woo potential customers, Tesla representatives will ask for home addresses and then search satellite imagery of the house to estimate how much sunlight they’ll be able to capture. Tesla’s solar power system generally costs between $10,000 and $25,000, with batteries costing an extra $7,000. According to Bloomberg, it will cost about $52,000 for the average homeowner to install solar tiles on their roof. This Home Depot venture will help determine if the average consumer is ready to spend that much to embrace solar power, or if solar mass appeal is still science fiction.